Product code: ES6512 Categories: Modern & Retro Jewellery, Modern Rings & Engagement Rings. 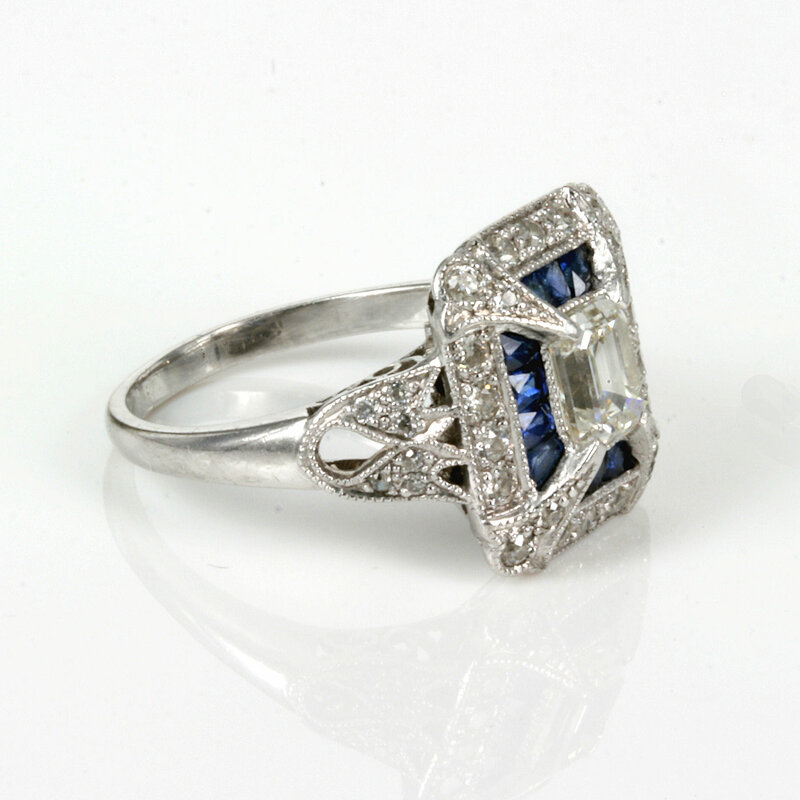 This is a stunning sapphire and diamond ring and one that would make the most fabulous sapphire and diamond engagement ring as well. Made in 18ct white gold in a style and design reminiscent of the Art Deco era of the 1920’s, the design of this ring has a wonderful geometric design that made the rings of the Art Deco so popular and is a style still sought after and replicated today as can be seen in this ring. The ring is set with a emerald cut diamond in the centre weighing 1.03cts, and is H in colour and VVS in clarity, meaning it is nice and white and a very clean diamond. And giving this ring even more sparkle is the addition of another 34 diamonds that total 0.60 carats. These other diamonds are not just simply around the border and down the band but are so much a part of the design of this ring. There are diamonds set into the claws holding the centre diamond and the diamonds down the band are set in the most wonderful design. 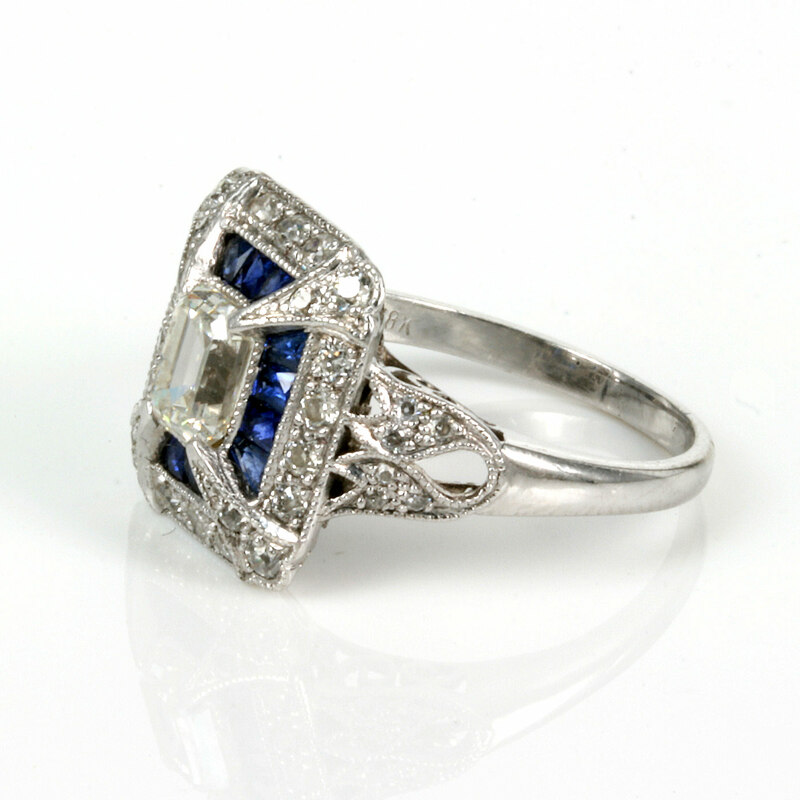 All of the diamonds are millgrain set which was typical of the Art Deco jewellers where there is a fine crimping along the edge of the diamonds adding so much extra charm and character to an already stunning ring. Then of course are those 14 vibrant blue sapphires surrounding the centre diamond that adds not only colour but gives this ring such an elegant appeal. These sapphires total 0.70 carats and are such a perfect blue in colour. Even the design under this ring is stunning and also romantic with the swirl design replicating a heart again making this a wonderful and unique sapphire and diamond engagement ring. This ring is simply stunning from all angles and it is so easy to fall in love with this ring.